After 20 years on stage as a professional dancer, John Arms turned to yoga to heal his body from a serious dance injury. Through yoga he was exposed to kirtan—a meditative form of music—and began his journey into bhakti yoga (the yoga of devotion). As a self-taught guitarist, he quickly formed a deep love for kirtan, amazed at it’s ability to move his heart and soul. 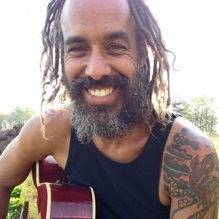 Since 2009 John has played alongside many local and international kirtan artists including Wade Morissette, and was a regular guest vocalist with Ragani from 2012-2015. 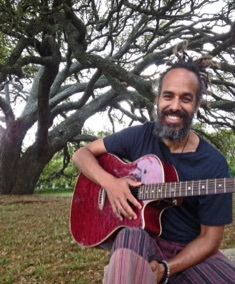 In 2011 he began co-leading kirtan with his now partner, Marty Tribble, and they released their debut mantra music album, Divine Play, in September of 2014. He has appeared at Bhakti Fest, Hanuman Festival, Milwaukee’s Yoga @ the Museum, Kirtan Fest Milwaukee, Yoga Rocks the Park, Festival of India, cOMmon Grounds Festival, Twin Cities Kirtan Festival and dozens of yoga studios throughout the United States. For bookings and questions, please connect with John. John has presented at the following locations. To book an appearance with John for your group, studio, festival or event, please connect with John.